Is Anyone Familiar With This Sierra Madre Rescue Dog Rumor? I always feel a little proud when this blog is the first place to report on an important story. Nothing is more fun than breaking some real news to the people who want it. This is what gives readers a reason to go to The Tattler. You just don't know what can be found here on any given day. The most recent example of what I am talking about today would be news of the hiring of our new Director of Planning and Community Preservation, Vincent C. Gonzales. Nobody knew anything about this guy or his new job until that news was first made available here. This was something City Hall had known about for a while, but decided for whatever reasons to keep it all a big secret. Even the City Council had not been told about it. Which is probably not the best way of doing things. After all, it was the City Council who had decreed that we needed a Planning Commission firmly tied to Community Preservation. Vincent is a guy whose planning past is tied to heavy high density redevelopment projects, which is a field of endeavor about as far away from Sierra Madre community preservation as Attila the Hun is from Gandhi. Doesn't make him a bad guy mind you, just not the right fit for what this town needs. So here is our next breaking news story. A friend of mine was out of town attending a convention of some sort. And while there he met with some people who mentioned that they'd heard this crazy rumor about Sierra Madre, a paramedic and her rescue dog. Apparently this paramedic was fired for what many in the department feel was not a very good reason. Like most who work there she was a part-timer, in this case one that also does work for the LA County Sheriff's Department. This individual saw what she thought was a need in this town, which was for a trained rescue dog. Something that would be useful in many emergency situations. Knowing that Sierra Madre had no budget for a rescue dog, she decided she would use her own money to purchase a fully trained one herself. 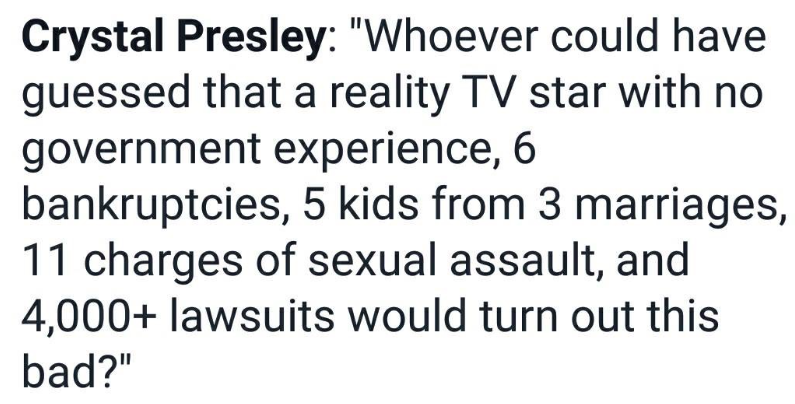 The cost being $5,000. Which is a lot of money for anyone, much less someone living on a part-time paramedic salary. It seems to me that this was a pretty generous thing to do. Long story short, the woman was fired from her job here. Apparently the City Manager caught wind of this, didn't think the dog had any place there among the Paramedic and Fire Department staff, and sent this woman and her dog packing. There is now a lawsuit, of course. In this day and age city employees cannot be summarily fired without a carefully prepared reason. 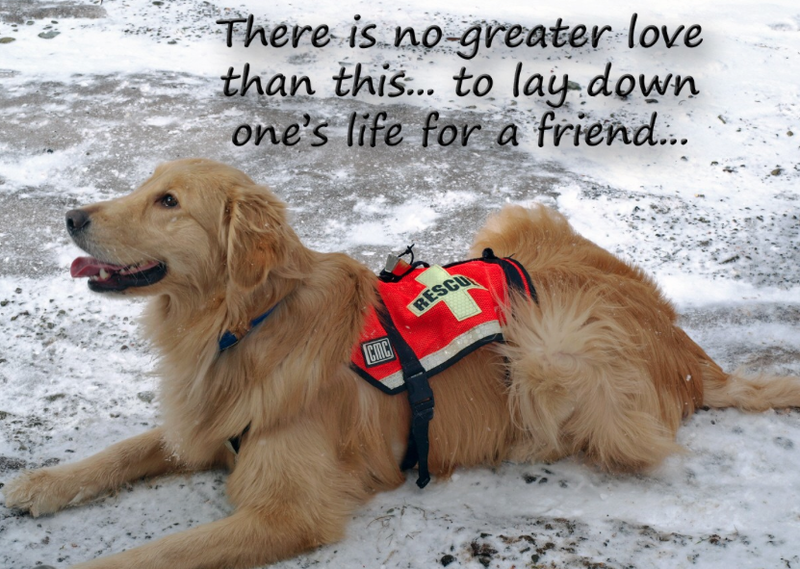 Using your own money to purchase an expensive rescue dog, and for a department where such an animal would be put to the very best use, just doesn't seem like a good justification for such a dismissal. If anyone has any details to add to this story, please let us know. Last Sunday I had an opinion piece in the Pasadena Star News (link) that called for an at least temporary halt to Regional Housing Needs Assessment numbers, or RHNA. Cities in California have been required to meet these numbers for quite a few years now, and nobody is particularly happy about it. In case you are blissfully unaware, these are mandated new housing development quantities handed out on behalf of the many cash friendly Sacramento construction and Realty lobbies (along with their all too agreeable legislative pals), by organizations called Regional Planning Organizations, or RPOs. Our RPO is known by the unfortunate acronym SCAG. The threat here is that any city refusing to enable planning for RHNA mandated increases in SCAG housing runs the risk of being hit with all sorts of dire Sacramento financial penalties and consequences. The state can be real jerks about it. This so-called "RHNA process" is supposedly done in order to meet the housing needs of the many mythological new people arriving in California any day now. Even though there haven't been very many of them in the last few years, with nearly as many leaving the state as showing up. In places such as Sierra Madre, which like many towns thinks of itself as being built-out enough already thank you, these numbers are particularly onerous because they are often responsible for driving the kinds of unwanted high-density stacked and packed generica that many feel is out of character with their special place in the sun. So here is my question. Are RHNA numbers relevant anymore? Particularly when Governor Jerry Brown has now decreed that places like Sierra Madre, Arcadia and Pasadena, along with many other similarly water cursed communities, must somehow reduce their usage by as much as 35%? How can you tell cities to build a lot of new high density condos while a the same time ordering them to cut their water use by draconian amounts? That doesn't seem reality based, even for Sacramento. Thorne, Olson in Sacramento today for Legislative Action Day - City mayors, council members to focus on water policies, housing, transportation issues: Pleasanton Mayor Jerry Thorne and Councilman Arne Olson will be in Sacramento today to talk to legislators about transportation, public safety, economic development, housing and infrastructure and water policy issues. They are part of the League of California Cities annual "Legislative Action Day," an event that brings hundreds of city officials to the state capital to focus on the organization's and individual cities' legislative priorities. The issues to be discussed by the Pleasanton representatives are aligned with the city's general interests as well as the City Council's current work plan. Thorne and Olson also will ask legislators to make changes in the Regional Housing Needs Allocation (RHNA) law by either extending the current planning period to allow communities to reduce building toward achieving the RHNA-imposed housing numbers or by suspending RHNA housing numbers until the current state drought is over. So Exactly Who Are Goss And Harabedian's Mysterious No Show McMansion Men? "The highlight of the evening, if you can call it that, was after Denise nominated Capoccia for Mayor, Arizmendi seconded. Harabedian then nominated Goss to be Mayor Pro Tem (since he got the most votes - who were you people who voted for him, and I'm sure you regret it now!) … and nothing happened. Delmar and Arizmendi were very loud in their silence. Finally, Cappoccia seconded." - a reader comment. Throughout the discussion of Ordinance No. 1364 last night, John Harabdian and especially Gene Goss kept referring to people they had spoken with who opposed things like having to get a CUP for putting a new second story on a house. According to Gene there were a lot of these folks. Yet unlike the many people who showed up at this meeting to support what will now become an essential tool in stopping Arcadia-style mansionization here in Sierra Madre, Harabedian and Goss's allies were nowhere to be seen. Actually they have never been seen. Not even once. Nor did they ever do things like send e-mails to the City Council, or make phone calls, or even let people know what their names are. Nothing like that. They're like ghosts. Yet these were the very people whose point of view was being quite aggressively represented by both John Harabedian and Gene Goss. Which is funny, sort of. People complain about anonymous comment posting on this blog from time to time, but what about the opinions of anonymous people having that much influence at a City Council meeting? Kind of unprecedented. So who exactly were Harabedian and Goss advocating for? You really have to wonder what it is these people have to hide. Why won't they show their faces in public? Are they fugitives from justice? Are these people even from this country? Do they represent large amounts of foreign capital? Shouldn't the residents of this city have the right to know something like that? At the end of this rather lengthy two meeting rhubarb John Harabedian won a very small victory, and at the last possible minute. He also bought himself a little more time. It took him an awful lot of talking to get even that. But it seemed like little more than a face saving exercise at best. This was a sad way for someone who had done a lot of good on the McMansion issue to end his year as Mayor. And to what purpose? And, perhaps more importantly, for whom? As was discussed last night, the Preserve Sierra Madre folks supplied the City Council with a packet of photos showing two story development has negatively impacted neighbors, robbing them of things like mountain views, sunshine and property value. Here are the addresses. Once again the residents of Sierra Madre won a big victory over Arcadia-style mansionization. But it was no easy thing this time. And given the mysterious and anonymous nature of the opposition to the Planning Commission's recommendations regarding changes to the Municipal Code, it was all just a little strange as well. After that a new Mayor and Mayor Pro Tem were chosen, and everyone went off to have cake. There were some public comments delivered last night, and all were very worthwhile. None opposed the Panning Commission's recommendations. I got copies of two of those speeches e-mailed to me, and thought I should post them here. The first one comes from MaryAnn MacGillivray, and in her absence (yesterday was MaryAnn and Duncan's 42nd wedding anniversary), was read by Teryl Willis. I cannot attend the meeting tonight as I had originally planned, hence this late email. 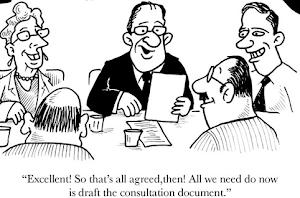 · The Planning Commission deliberated for several months, took public testimony, incorporated testimony and information gleaned from the General Plan Update process and applied their collective experience in reviewing projects to formulate the changes. · You, as a council, have taken public testimony that supports the recommendations. There is ample data available within the General Plan Update process to date, including the results of town hall forms attended by hundreds, yes hundreds of residents, an on-line/mail survey, and many months of public input at the General Plan Steering Committee meetings. 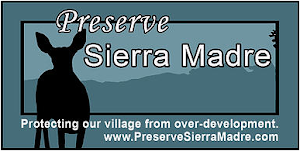 · The Preserve Sierra Madre Coalition has clearly articulated the rationale for the changes in public comment at City Council meetings and in numerous emails and letters directed to you; these communications summarize the positive aspects of the changes directed at “preserving” the character of our city by carefully managing land. 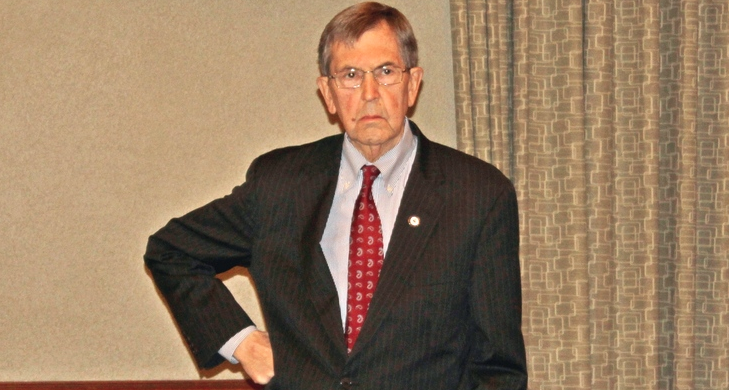 · The City Attorney explained the merits of the recommendations to you at your last council meeting. The Planning Commission, the members of which trump the council’s land use expertise and longevity of experience, was deliberate and thorough. They considered many iterations and consequences that might occur as a result of the changes they were recommending, but always with a focus on the common good and the desires of the community to “preserve” its character within the confines of individual property rights. To go outside of that based on personal opinion or opinions gleaned from a limited number of individuals in a more personal sphere is arrogant and inconsistent with your campaign promises and your obligation to your electorate. It is always best to have a unanimous vote of the Council on matters of this import and the Mayor Pro Tem tried to get there. 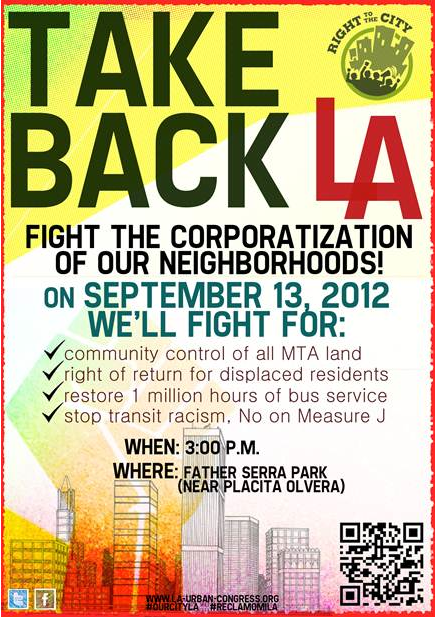 But to compromise the consensus of the citizens of Sierra Madre to get that vote is not in the best interest of the community. This preservation effort is real and incipient. In addition to the projects already of concern, there are a number of large properties that have been held in families for many years that will be disposed to heirs in the next decade. These heirs may feel differently about or may not wish to live in Sierra Madre and these properties then are at risk of development. 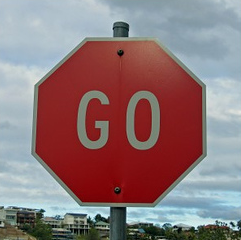 Living in Sierra Madre has value and it may just come with the cost of following the rules. The other statement had nothing to do with any of the above, and it involves a very different kind of development. Apparently in Sierra Madre you could be subjected to half a decade of legal harassment, and at a considerable expense to the taxpayer, if you dig yourself a really deep basement. Yet if you build something like those two awful (and quite unsold) buildings on Camillo Road, you will receive the full and complete cooperation of City Hall. And perhaps a couple of councilmembers as well. As you are aware, we have been defending ourselves from the City initiated lawsuit claiming our property is a public nuisance for the past five (5) years, and the City will finally be required to prove their allegations against us when our trial finally begins. We know that many of you have an interest in knowing what is going on with our case. I doubt anyone other than the City Manager has any idea of the true facts, or the excessive amount of money spent on the retaliation against us. In a response to our Request for Public Records for invoices the City received from the Dapeer law firm related to the prosecution of our case, the City provided invoices dating from October 2010 to April 2013, which totaled over $282,000. The City failed to provide invoices beyond April 2013 and has not responded to our request for confirmation whether such invoices exist. Since I can’t imagine the Dapeer law firm working for free, I expect that the City has incurred at least another $280,000 to perpetuate this prosecution. That does not include the upcoming trial that will most likely run another $100,000. Is it just me or do others agree that the $600,000 of taxpayer money could have been used in a more productive way? 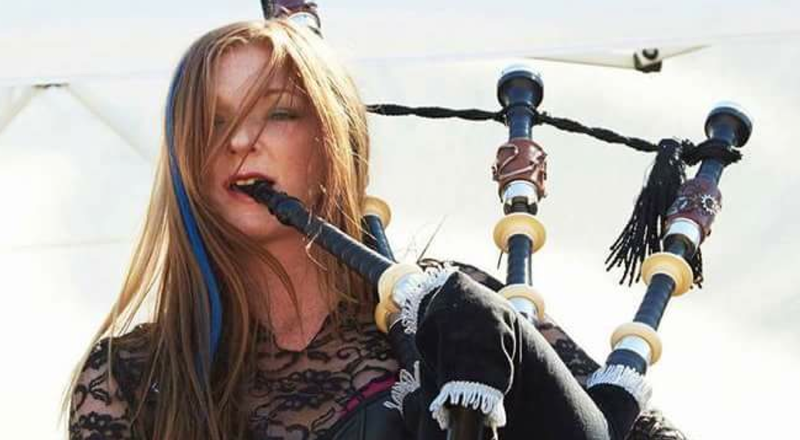 For those of you, who have an interest in knowing more about our story, please go to: http://www.Sterlingoak.wordpress.com (link). For those of you that have an interest in understanding how the current Public Nuisance laws are being misused, go to: http://www.PublicNuisanceSham.com (link). The month of May will keep us busy with trial preparation; however, we are open to answering any questions and speaking with anyone who is interested in knowing the truth about our case. At this time, we would like to thank all of you who have shown your ongoing love and support. We are very fortunate to be surrounded by many wonderful people and that has given us the strength to keep striving to expose the truth. 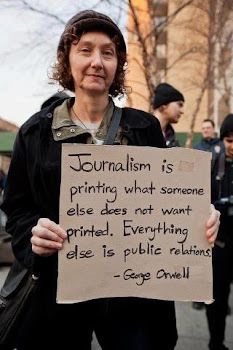 For others who may be interested in supporting us, we totally understand your fear of retaliation, so you may anonymously support us by going to: http://www.GoFundMe.com/Sterlingoak (link). Thank you and we are looking forward to complete and total vindication. Am I the only one who finds this sad episode to be entirely incomprehensible? Why wasn't this all settled out of court years ago? I am not sure this will quite live up to the Mad Max Thunderdome sounding title of this post, but it is fairly edgy nonetheless. Due to a longstanding tradition here in Sierra Madre, one that links the sequence of Mayoral succession to the amount of votes each candidate received when running for office, we now have the #3 vote recipient in the 2012 election John Capoccia becoming Mayor, and the #1 vote recipient from the 2014 election, Gene Goss, moving up to take the Mayor Pro Tem slot. Of course, there is a wrinkle in this otherwise time honored picture. Had Sierra Madre's traditionally determined order of succession been followed in 2013's Mayor Pro Tem selection, we could very well have been watching Mayor Chris Koerber passing the gavel of all Foothill Village power to John Harabedian tonight. Is it possible that soon to be Councilman Harabedian will find himself wondering why he was in such a big hurry back in 2013? The last year of his term could end up being something of an anti-climax for him. I'm not sure that the soon to be former Mayor of Sierra Madre ever really found whatever it was he believed he needed to get so quickly. Good things come to those who wait, as they say. Then there is this. Mayor John Capoccia may be called upon to deliver a UUT increase, one that could be on the ballot in April of 2016. The third of its kind since 2012. This could end up being the theme of his year in that office. Rather ironic considering that he was originally elected as a tax skeptic. But enough of that. There isn't much beyond the largely ceremonial reorganization of the City Council on the agenda for this evening, but it is possible to find two items on the Consent Calendar worth being concerned about. Judging by the Agenda Report everything is just hunky dory with this one. However, not everyone agrees with that assessment, and there are some people in town who are of the opinion that Sierra Madre is being rather blatantly ripped off by the YMCA, and for quite a bit of dough. 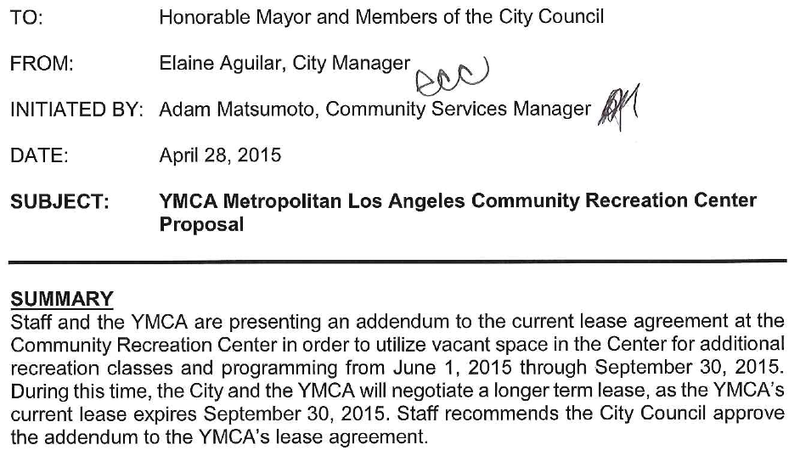 An interesting sidelight re: agenda item 1C for April 28, regarding the YMCA contract extension. The City is essentially giving away the store on this one. The extension is to be in use until the end of September when contract negotiations are finalized for a contract renewal. However, under the current contract, the Y pays the City $600 something a month for the use of the Fireside room which has been converted into a nursery school classroom, and the YAC which has their very expensive after school babysitting program. The City pays all the utilities and maintenance. This extension gives them the right to use the Sierra Madre Room six days a week, 8:00 a.m.to about 9:00 p.m. week-days and Saturday mornings to conduct exercise classes. They will give the city 25% of the income from the classes. 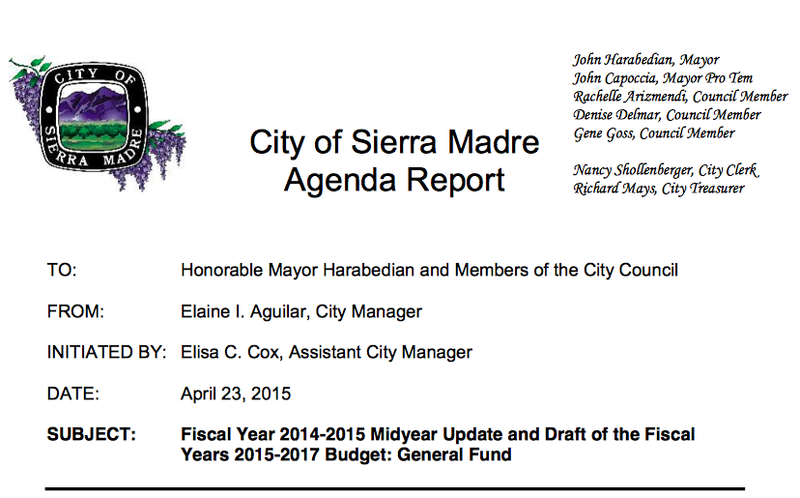 If the city wants to use the Sierra Madre room when they have classes scheduled, they need a 2 week notice. They also are granted use of the offices which for now they say will be for childcare. But who knows what will be in the contract renewal. My take on it is that the Y will have overall control of the building. Waterworks at least pays enough rent to allow for maintenance, and they pay utilities. The Y claimed at the Community Services Committee that they are non-profit so they can't afford to pay much more. Someone on the City Council might want to pull this item out for a little further conversation. The other item that could cause a bit of agita tonight is this one. It is in the second slot of the Consent Calendar, right behind the spending of $763,000.00 or so big ones. Now you may recall that at the last City Council meeting this matter devolved into something of a rhubarb. One that resulted in a tight 3 to 2 vote in favor of what will become an effective check on the kinds of unfortunate mansionization found in such blighted cities as Arcadia. 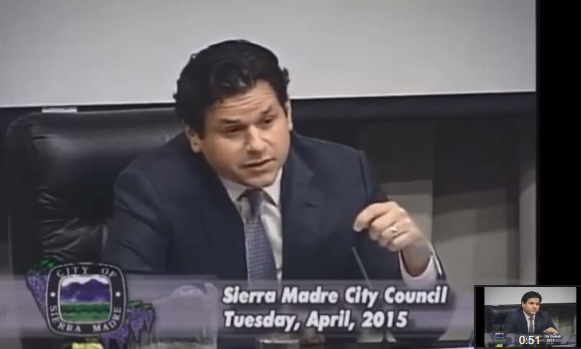 This conversation had its more bizarre moments, with Mayor Harabedian and Councilmember Goss actually inferring that many in this community had become paranoid or delusional over the McMansion threat facing Sierra Madre. Which was unfortunate, especially when you consider that it was only a few weeks earlier that they too had expressed strong concerns about the troubling potential for mansionization and over-development here. You almost have to wonder what unsettled spirits had taken possession of the guys. Here are two video segments that will take you back to their dark places. We'll start with John Harabedian. 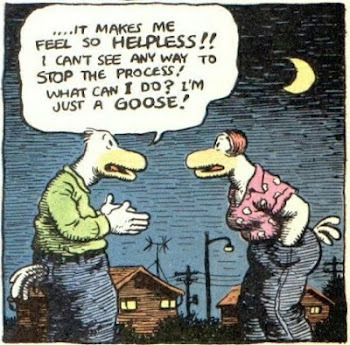 Gene Goss also had some particularly unhappy things to say on this topic that evening. I wonder if Mayor Harabedian was including himself and Gene Goss in this cheery assessment of the "manner and tone" that evening. Hopefully things will go a little more smoothly tonight. What Exactly Are Community Budget Outreach Meetings? They can also be called Community Input Meetings, and some are coming soon. But what exactly are they? I mean, what are they really? 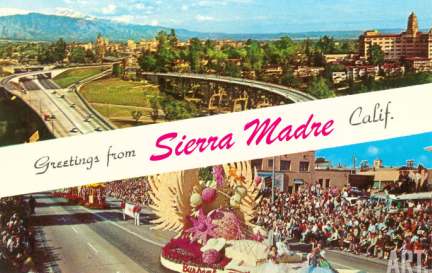 From conversations I had over the weekend they appear to be an attempt by the City Council to break out of the City Hall bubble in order to get a read on what the residents of Sierra Madre think about the big issues facing their town. With the first topic being, of course, money. That plus the approaching time when there may not be enough of it to sustain Sierra Madre City Hall in the manner to which it has grown accustomed. Now we here at The Tattler have expressed our concern that this is the beginning of yet another attempt to get the UUT back on the ballot. For an unprecedented third time, let me add. With the intent being to allow the residents to know about the many terrible things that will happen if they don't knuckle under and raise utility taxes to, let's say, 8%. 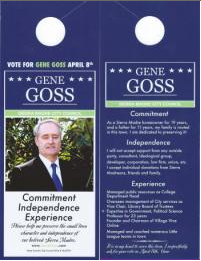 Or two ticks above and beyond the 6% rate the residents approved at the polls. Twice. 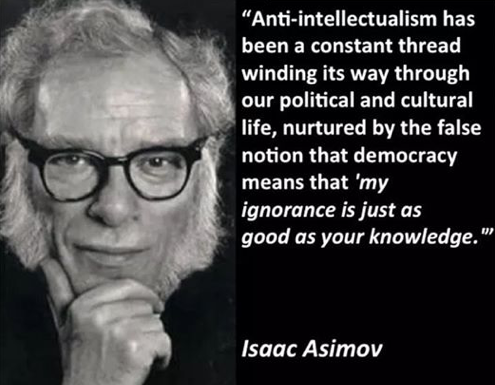 But I have been told that this is not necessarily the case. The City Council really does fear that a third attempt to raise utility taxes would not be very well received by the residents, and they don't really want to have to risk that. Instead they want to find out what people really do think about all of this, and then move on from there. So I have suspended my disbelief for the moment. Here is what I took away from those conversations. 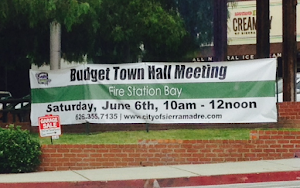 The Outreach Program is supposed to be a way for Sierra Madre's elected officials to have a dialogue with residents and business owners outside of City Council and various commission meetings. One goal is to have a series of meetings on one topic every quarter. The idea is for City Council members to go to various community and civic meetings to discuss a selected topic. There would also be a large Town Hall meeting, and an online meeting for people with computer access who can’t get to any of these meetings. The first topic is, quite naturally, the General Fund. As we are all aware, the expenses for FY16 and FY17 will be far greater than revenues. There are several reasons for this. The General Fund has taken on extra expenses over the last few years with the National Pollution Elimination Discharge System (NPDES), Workers Compensation Liability Payments, Calpers, increased police salaries and benefits, the Paramedic program, and additional Fire Department personnel, a large portion of whom are now actually being paid. In case you didn't know. Apparently they have volunteered to get paid. The General Fund has also lost significant revenue with the loss of the CRA, along with the UUT sunsetting back to its original 6%. The community meetings with various groups, plus the Town Hall and online meetings, are an opportunity for residents to tell their elected officials not so much what to “cut,” but what programs they want to keep. 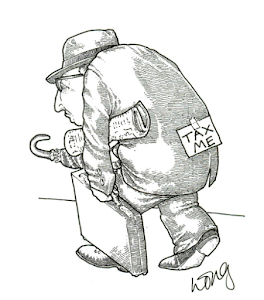 Along with ideas for revenue, either through a parcel tax, the dreaded increased UUT, or raising fee costs. Or even out of the box, charge a fee for the fire volunteers who are getting their training here in Sierra Madre before moving on. Or perhaps a car wash and a big bake sale. City Hall probably needs to stop accusing people of getting the city into this situation, which we heard a lot of at last Thursday's special City Council meeting on the budget. It didn't happen overnight and they should have seen this coming. And, from City Hall's perspective, wouldn't a 6% UUT be better than a 0% one? As much as some would like to use the reserves to balance the budget for those two years, it would only be passing the buck on to another City Council. The City needs to now be very realistic and live within its means. This is not as simple as raising the UUT or eliminating the Library, or contracting out the Police Department. It could take a combination of eliminating expenses (which means some services and personnel cuts) and increase of revenue of some sort. That is, if you would go for it. For the people who are not part of the Community Foundation, Rotary Club and Kiwanis, the big Town Hall on May 9 is very important to attend. They say they want to hear what you have to say. So please, do let them hear it. Here is the schedule from the City Manager Report. On behalf of the Preserve Sierra Madre coalition, we just wanted to reiterate our support for all of the Planning Commission's recommendations to improve the Municipal Code. 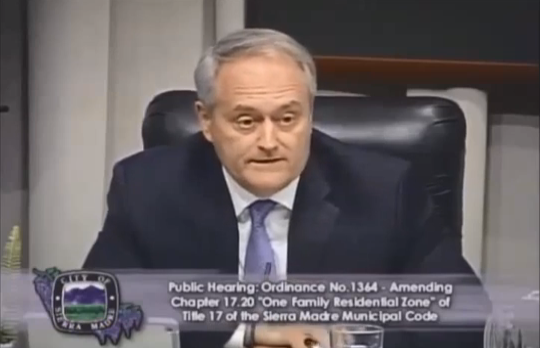 We also wanted to address a few of the issues that came up at the last City Council meeting. 1. We don't think there is anything wrong with 2-story homes. As was pointed out, there are many 2-story homes in Sierra Madre. We are talking about changes to what exists right now by either a developer tearing down an existing home and building a new, usually 2-story home or an existing owner of a 1-story home that wants to add a second story. All we are saying is that because the 2nd story has the most chance to impact on the neighbors' views, light, privacy and value, the burden should be on the party making the change to show that it will not adversely impact on the neighbors. That is the purpose of going through the CUP. Keep in mind that the existing owners chose their home and paid a certain price because it might have certain attributes like views, natural light coming through the windows or privacy. In the whole scheme of things related to building a new 2-story home or adding a 2-story, the cost and delay from a CUP is not to much to ask to make sure that its done in a manner that is compatible with the existing neighborhood and the least impactful on the neighbors. It doesn't mean they can't do it. The mandatory CUP for 2nd stories is simply an acknowledgement that there needs to be a reasonable balance between the property rights of an owner who wants to change things and the property rights of the neighbors who don't want to see someone else's dream home become their nightmare. 2. We don't think such a CUP process will lead to fighting amongst the neighbors. If the project is a good one and minimizes the impact on the neighbors, the owner building the 2nd story should not have any concerns. If it will have a significant impact, then give the neighbors a chance to discuss that in an open forum. If you really want to see fighting amongst the neighbors, let a project just get rammed down the neighbor's throat with no input from them. It seems to us that would lead to a far worse breach amongst the neighbors. 3. Finally, squeezing down the floor area limits is something that cities are increasingly recognizing as a solution to the mansionization that is occurring all over the San Gabriel Valley and elsewhere. We have always had limits and always will. The discussion really is about where to put the ceiling. 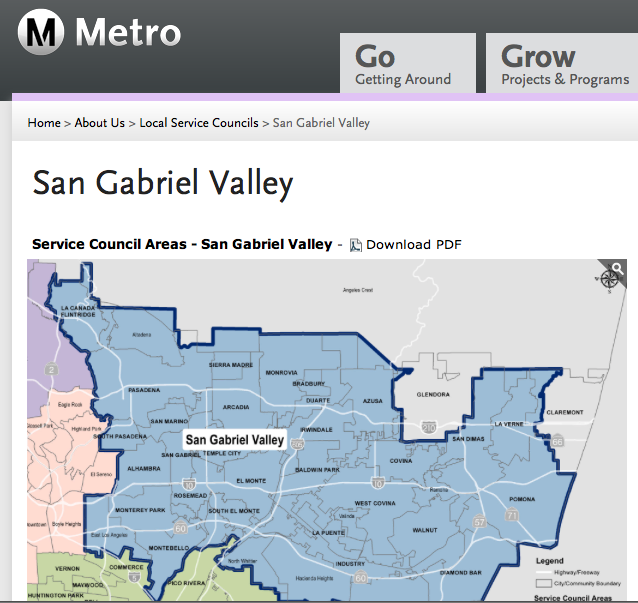 Given what we see happening in other cities and what we are starting to see in Sierra Madre, it seems reasonable to try to get out in front of this issue by lowering those ceilings. We would respectfully suggest that the Planning Commission's recommendations be approved without modification. If we run into some issues or complaints down the road, we can all re-visit the issue. We suspect, however, that rather than receive complaints, you will instead receive the accolades from grateful Sierra Madre residents who see these provisions as a big step forward in preserving our village in the foothills. Thank you for all your hard work and efforts on behalf of our community. Here is an interesting unintended consequence. Unintended consequences usually being the result of too much hubris combined with not enough thought. Cities in California have been required to meet their Regional Housing Needs Assessment (RHNA) numbers for quite a few years now. If you were not aware, these are mandated new housing development quantities handed out on behalf of the many cash friendly Sacramento construction and Realty lobbies (along with their all too agreeable legislative pals), by organizations called Regional Planning Organizations, or RPOs. Our RPO is known by the unfortunate acronym SCAG. You might have heard of them. They're famous for making population increase predictions that often turn out to be laughably inaccurate. Not coincidentally, they're also big 710 Tunnel fans. The threat here is that any city refusing to enable planning for RHNA mandated increases in SCAG housing run the risk of being levied with all sorts of dire Sacramento financial penalties and consequences. It's a build or be busted world out there. 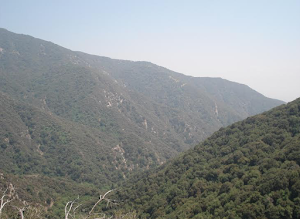 In places such as Sierra Madre, which like many towns thinks of itself as being built-out enough already, these numbers are particularly onerous because they are often responsible for driving the kinds of unwanted high-density stacked and packed generica that many feel is out of character with their special place in the sun. That and cookie cutter development planning mandates generated from beyond by Sacramento hardly work in our wonderfully idiosyncratic local communities. They don't work very well anywhere else either, as some of the more capitulatory communities discovered. Just go and look for the afflicted blocks with half empty five story stretches of identical housing, with drab faded "for sale" flags flapping feebly out front. Move in tomorrow, they promise. Or any other time if you prefer. Your lifestyle demands it. How can these cities be expected to accommodate a significant percentage of new state dictated high density housing while also cutting their water usage by more than a third? Here in bucolic Sierra Madre the debate has been how much additional water use reductions can people be ordered to make after having cut back a lot already. Or so they believe. Well, Governor Brown has settled that question for them. If it all goes through as planned, that number is 35% additional reduction. 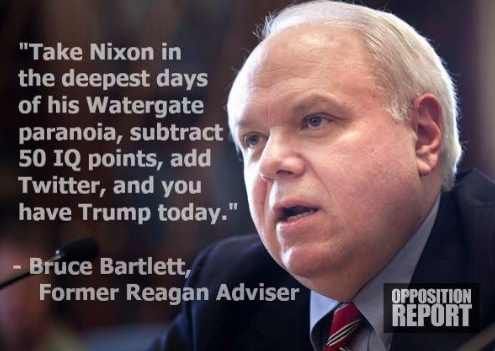 But things get even worse. Cities that do not meet this rather arbitrary 35% water use reduction number could soon find themselves being fined $10,000 a day. Which is a large number even for government, and an amount that would quickly put a noticeable dent in any city's General Fund. So does Sacramento believe that cities such as those we've mentioned here, locales now ordered to make draconian 35% water cutbacks tout suite, can also knuckle under to the kinds of increases in SCAG housing its Sacramento mandated RHNA numbers require them to enable? How does a community reduce its water usage by over a third while at the same time packing in new SCAG housing that will require lots more water? Seems like a conflict between Sacramento's central planning housing mandates and its water conservation priorities to me. Maybe someone at your City Hall could ask them about it? Perhaps when it comes to mandated development Sacramento should just leave everybody alone. Especially now that the water is almost gone. Otherwise people will just start thinking of them as being all wet. 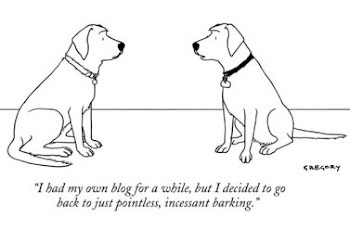 John Crawford runs the locally significant Sierra Madre Tattler blog. Not how we do it, but cool anyway. Here is an example of irony at its finest, and an example that you might only find in Sierra Madre due to the vast disconnect between the people living here and current City Hall management. Which, judging by the recent actions of City Manager Elaine Aguilar, apparently believes they are permanent and above any possible challenge. Somebody yesterday made the following rather apt observation: "If the City Council saw fit to change the name of Development Services to Planning and Community Preservation, you would think that a new staff hire would need to be far and above qualified to fulfill that position." This comment referred to the inappropriate hire of our brand new Director of Planning and Community Preservation, Vincent C. Gonzales. 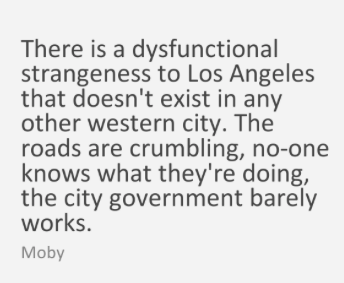 Someone whose background as both a Pasadena Redevelopment Project Manager, and Metro flack for some of the bad things going on in LA County (including the 710 Tunnel), makes his coming here unfortunate. Something that has those in town who have taken the "Community Preservation" part of that gig to heart in a state of outrage. And that irony we're discussing today can be highlighted by taking a look at what is going down in Boyle Heights, of all places. A community with very little in common with Sierra Madre. At least on the surface. 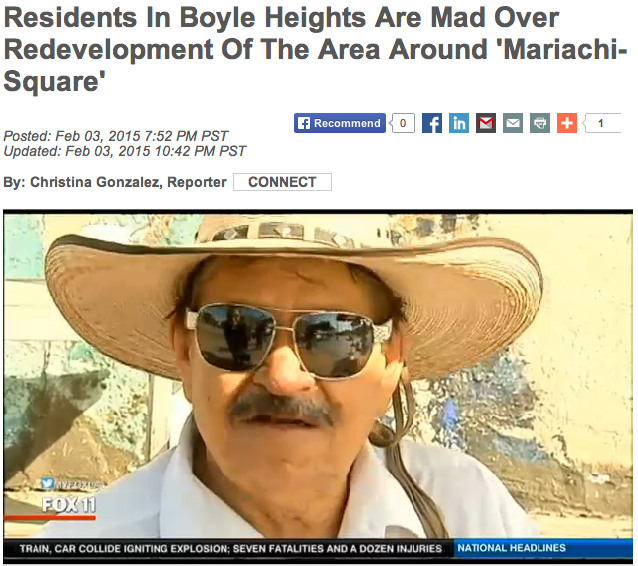 You see, it appears that the people of Boyle Heights are quite angry over the kinds of high density predatory redevelopment that are also unpopular here. With the actual connection between the two cities being our new Director of Planning and Community Preservation, Vincent C. Gonzales. This from the Detroit local affiliate of Fox News (link). 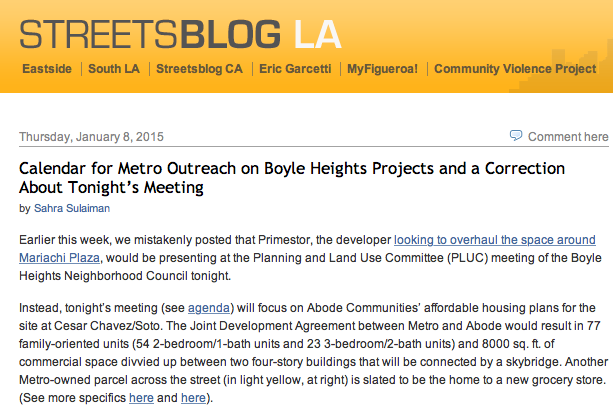 So how do you get a new Director of Planning and Community Preservation here in Sierra Madre who until yesterday was also involved in things such as an exploitative and extremely unpopular Metro redevelopment project in Boyle Heights? Again we turn to yesterday's comments. This was an inappropriate and secret hire made without the knowledge of the City Council. His past is redevelopment and high density mixed use planning. Is that the kind of guy that should run a department that calls itself "Community Preservation?" This is not how city business is supposed to be conducted. 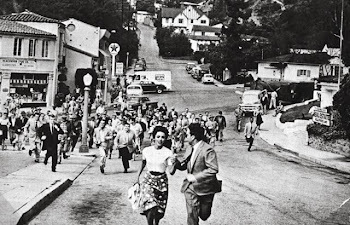 The fact that it was The Tattler who had to tell the people of Sierra Madre about this disaster is as good an indication as any of how badly this whole affair was mishandled. Elaine needs to go and find another job. It is my opinion is that this hire, intentionally or not (I personally believe it's the former), completely undermines the judgment and decisions of the City Council when they created the Planning and Community Preservation department in the first place. While under the current set-up at City Hall the City Manager does the government agency hiring in this town, such decisions should always be made with the wishes of the City Council in mind. With this hire those wishes have been seriously subverted. In my opinion, anyway. The remaining question being will the City Council actually defend its policies on community preservation, or further cede its authority to run this town's affairs to a hired employee. In the most recent City Hall e-mail blast the following observations were made about the recent Court of Appeal decision on tiered water rates. I have no reason so far to doubt that this might all be true. 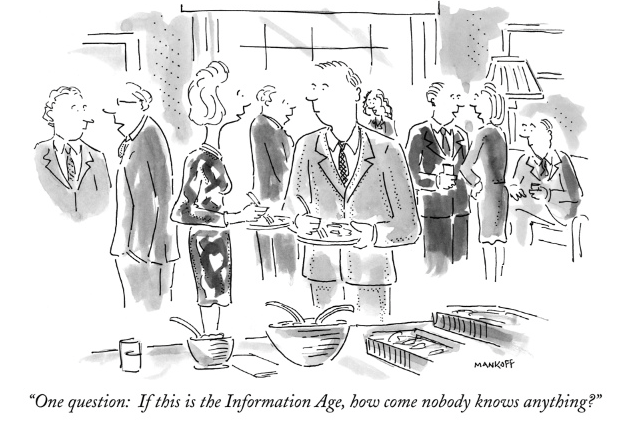 Of course, I probably haven't looked into it as much as I should. At least not yet. But did you know that the same law firm that provides us with our City Attorney is also the one that lost this water tiers billing case for the defendant in this case, the City of San Juan Capistrano? I kid you not. 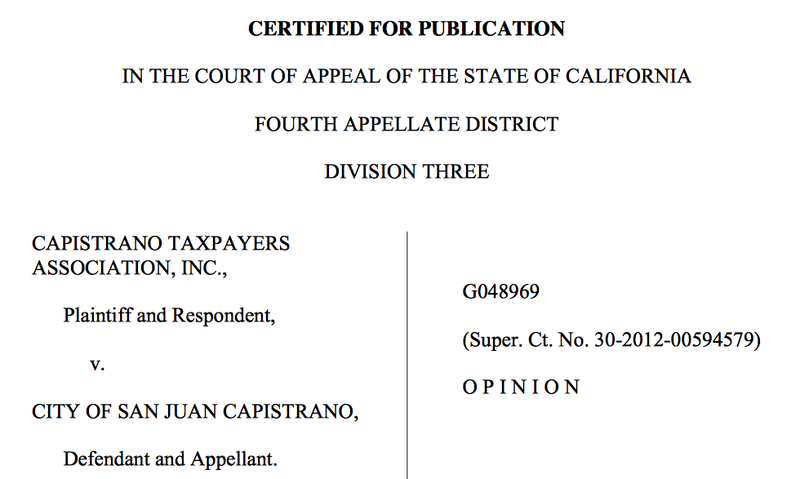 Check out the law firm in the following document from Capistrano Taxpayers Association, Inc. v. City of San Juan Capistrano (link). I'll bet Michael Colantuono (et cetera) told the City of San Juan Capistrano that they had their tiered water rates done properly as well. Except a Court decided otherwise. 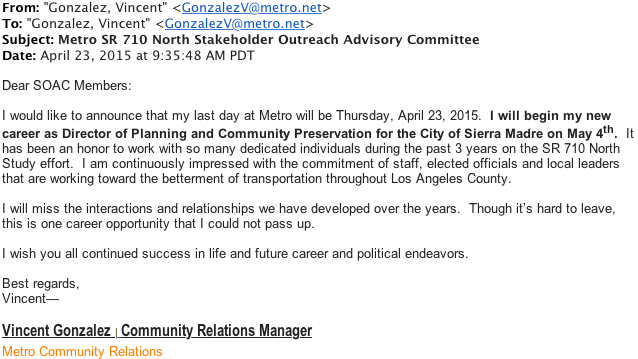 Sierra Madre's New Director of Planning and Community Preservation Was Until Today The Community Relations Manager for … Metro? Well, this has the potential for some disappointment. You would have hoped that Sierra Madre's newly hired Director of Planning and Community Preservation would be some kind of crackerjack planner dude with immense knowledge about things like how houses get designed, and what exactly must be done to preserve this community from the onslaught of mansionization that has engulfed so many of our neighboring cities. For many this is the #1 issue Sierra Madre faces. Apparently that might not be the case. Or so it would seem at first pass at least. As a matter of fact, it doesn't appear that our new Director of Planning is even a planner. Or at least he hasn't been one recently. Rather until the end of business today he was the public relations guy for Metro. The very people who are working very hard to build the 710 Tunnel, of all things. Though they have often denied that. This is certainly not the best of signs, at least in my opinion. Here is an email that was forwarded to me by a concerned friend yesterday. It reveals something of great importance that has yet to be shared with anyone in this community. Making this yet another instance where The Tattler, and not City Hall, is first to break the big news. Does connecting and interacting daily with the community sound like a job you would love? How about organizing events and communications to represent your organization throughout the community? If so, a job in community relations could be perfect for you. Community relations managers are responsible for managing all community development initiatives throughout the organization. They plan, develop and implement programs to promote community awareness. Community relations managers are responsible for supervising the image of the organization within the community. I'm not exactly sure how someone with that kind of experience is going to impress the folks on the Planning Commission very much. Pragmatic and practical people who generally are more concerned with housing set backs, R1 Zoning Guidelines, curb cuts and things of a more architectural nature. They are are not likely to spend too much time worrying about "the image of the organization within the community." It will be interesting to see how much more money he was offered to come here and learn his new position. I found a couple of examples of Vincent Gonzalez's work product on-line. For the record, it has always been the contention of The Tattler that Metro is not always above-board in their seemingly endless campaign to "Close the 710 Gap." And despite all claims to the contrary, the fix has been in on the 710 Tunnel for quite some time. This is due to certain geo-political realities that have prioritized the project, things having to do with getting cheaply produced foreign goods from the ports and to the big distribution points east of us more quickly. When you are a foreign country holding a few trillion dollars in American debt, profligate Uncle Sugar is going to listen to your needs. China wants the 710 Tunnel, and has made this quite clear to U.S. government officials over the last decade or so. Link here for an informed discussion about that one in the Pasadena Star News. So, given my opinions on this matter, I found the following letter to the Pasadena Weekly (link) to be a little disheartening. In response to the letter titled “Pasadena Must Lead,” I want to clarify that Metro is committed to a fair evaluation and an open process for the State Route 710 North Study. To say that the draft environmental document is “rigged” toward one alternative is incorrect. Metro and Caltrans recently announced the release of the study’s environmental impact report has been postponed to February 2015 to allow more time to complete the technical studies, including traffic, historical properties, safety, air quality and economics. The findings will help Metro/Caltrans and the public better understand the different alternatives and allow a fact-based conversation once the data is known. Metro/Caltrans will extend the public comment period from the standard 45 days to 90 days and hold public hearings throughout the study area to allow for review and feedback from the community. All of the five alternatives in the environmental document are being equally evaluated in order to provide the best traffic solutions to the local and regional areas. This includes: Bus Rapid Transit, Light Rail Transit and Freeway Tunnel, as well as the No Build and Transportation System Management/Transportation Demand Management Alternatives. We will continue to work with the city of Pasadena and other regional representatives in an open and transparent process. 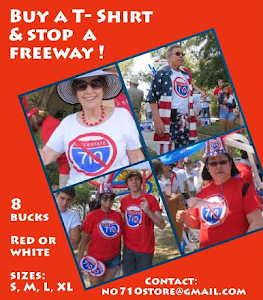 Your readers are encouraged to visit http://www.metro.net/sr710study to obtain accurate and most up-to-date information on the 710 North study. The problem here is the 710 Tunnel "process" really is rigged. Terry Tornek, Pasadena's new Mayor, was 100% right about this. And, as recent events have made abundantly clear, the tunnel question has been rigged for quite some time. Metro has not been truthful. 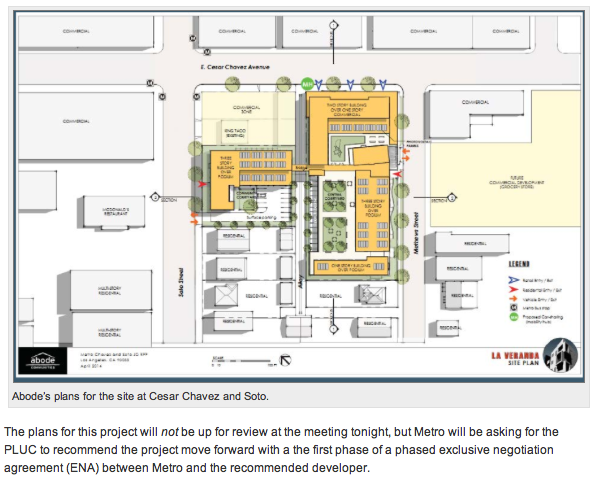 Moving on, and in fairness, there is a Daily Breeze article from 2010 where Vincent Gonzalez is listed as a "Project Manager" for a mixed use development project. Is that the same as a planner? Project Managers in Pasadena make about $160,000 a year. Why someone would leave so high paying a job for something at Metro paying about $100,000 less would be a mystery in my opinion. 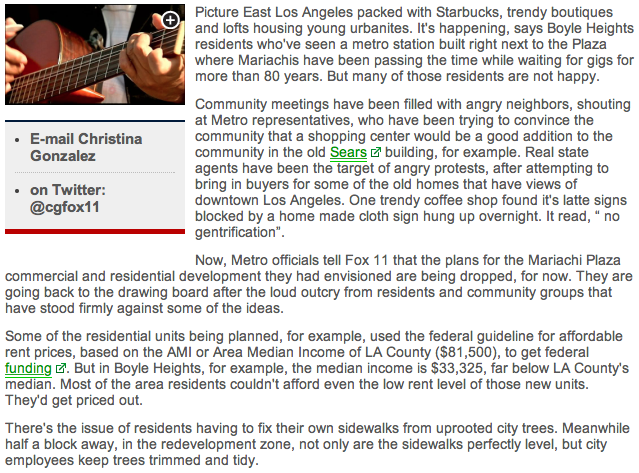 The article is called "Pasadena councilwoman dreaming of a Lincoln Avenue Renaissance," and you can link to it here. A nearly $200,000 city plan lays out the details of her dream - a mix of condos and apartments, boutique shops, restaurants, offices and community spaces that will create a pedestrian-friendly environment. If approved by the City Council next year, the Lincoln Avenue Specific Plan - which covers Lincoln Avenue mainly from West Montana to West Mountain Street - will improve one of the last areas in the city still in need of large-scale redevelopment. "Many people don't realize there's huge economic opportunities here because we are bounded by single-family residential" homes, Robinson said. "People would better utilize the area if it was more pedestrian-friendly, if it was more day-to-day uses ... There's not a whole lot of opportunities right now for that to be able to happen." If approved, the plan will bring mixed-use housing opportunities, such as ground floor shops with condos on top, to the corridor's west side, mostly from Howard Street to Pepper Street. "With residents living full time on the corridor, it would help revitalize that portion of Lincoln Avenue," said Vincent Gonzalez, one of the city's redevelopment project managers. "It would allow for more retail opportunities and more of a 24-hour presence on the street, as opposed to current uses where people are only working during the day and leave at night." So would a project manager for mixed use high density urban redevelopment projects be our kind of guy? This next item could also suggest to some readers that Vincent Gonzalez's heart might not be completely on board with the "Community Preservation" thing. This from Streetsblog Los Angeles (link). I wonder where you could fit "77 family-oriented units" in Sierra Madre? Would we have the necessary water? You can find an additional document of interest here. 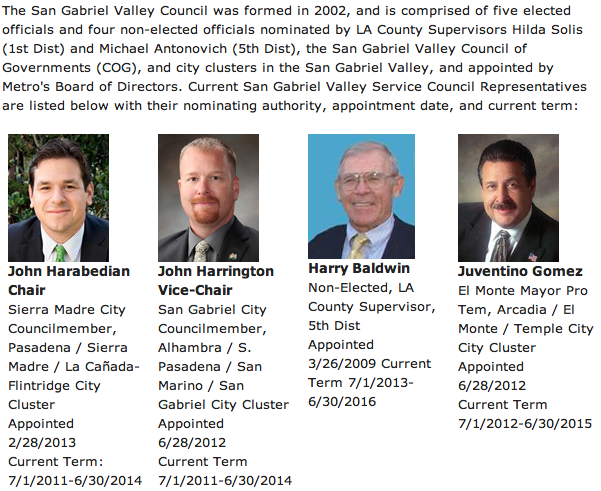 So how did so unlikely a candidate come to the attention of the City of Sierra Madre? How did a Metro publicist become the first person ever hired by this community for the exclusive purpose of planning and "Community Preservation?" And how did a guy who worked high density mixed use redevelopment projects in the past get a job in a town that is adamantly opposed to just that sort of thing? Well, I have an opinion on this as well. It was a little Metro magic, as it were (link). 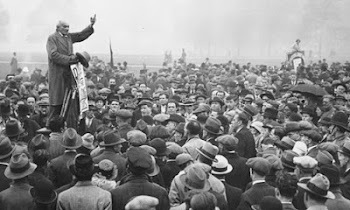 Does that look like a "Community Preservation" crowd to you? Are three guys from "The COG" enough do you think? Or, to put it into L.A. County jargon, is this cluster of officials made up of best practices stakeholders who believe in the process? At first glance none of this is very good news, I'm afraid. This budget agenda item was supposed to be discussed at the City Council meeting a week ago Tuesday. However, the baffling and frankly dangerous resistance by Mayor Harabedian and Councilman Goss to the Planning Commission's reformed R-1 single family zoning standards as found in Sierra Madre's Municipal Code took up so much time that this matter had to be bumped to a Special Meeting this evening. Why these two members of the Sierra Madre City Council decided to put so much energy and valuable time into playing chicken with the very real mansionization threat facing this community is beyond me. 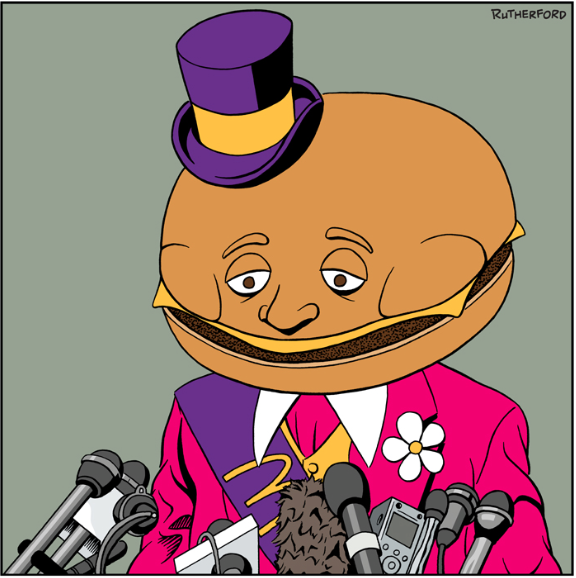 It certainly was not either Councilman's finest hour in my opinion. So anyway, what we have now is a special meeting (aren't they all special?) dedicated to this budget item alone. And if you think that we're going to be witnessing something tonight that has little to do with City Hall's desire to once again try and raise utility taxes for the third time in six years, well, then I have a bridge you might want to consider buying. Here is how the finest portion of the staff report for this evening looks. For the entire thing click here. As we are all well aware, the voters of Sierra Madre let it be known twice that they want this City's utility taxes to sunset back to 6%. 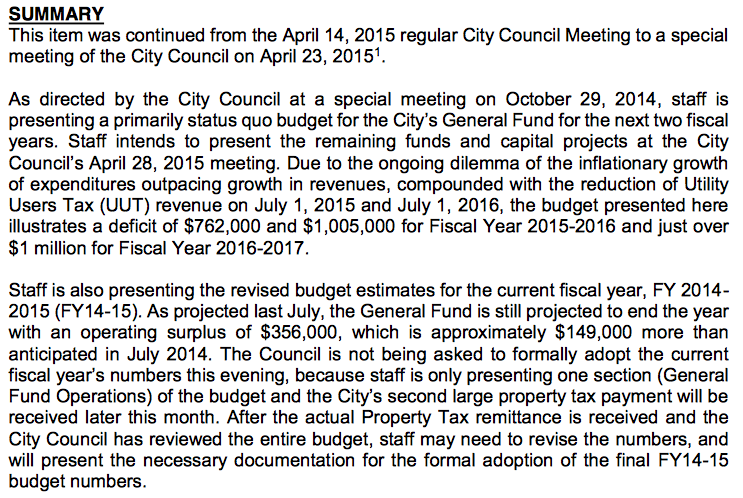 It now falls upon the City Council and staff to somehow make that twice resident approved revenue reality work. However, I am not completely sure they are up to it. Especially after Mayor Harabedian vowed in his State of the City address that he was planning to go out into the community and ask the residents what they want to do. Which is not something that I would call leading the charge. Besides, hasn't that whole "What would you cut?" strategy been used before? I think Noah Green ran for City Council using that slogan. I don't recall him being elected. The correct answer should be, "No, Mr. Mayor. What would YOU cut?" You wanted the job, so you do it. 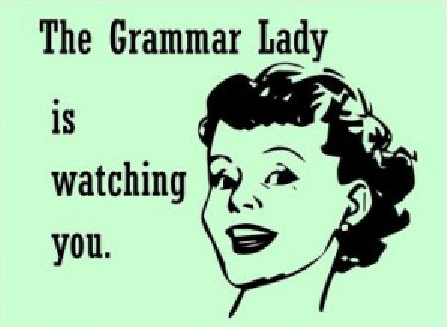 This is far too important a matter for passive aggression. It seems obvious that, having already voted twice to cut their utility taxes, the residents have made their wishes quite clear on this matter. Sunset the UUT and order City Hall live within the resulting budget. 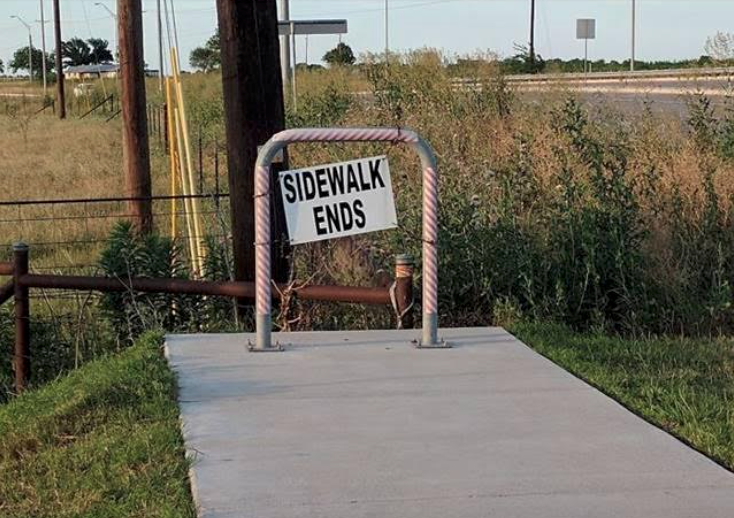 We'll have to wait and see if the City Council can handle that. 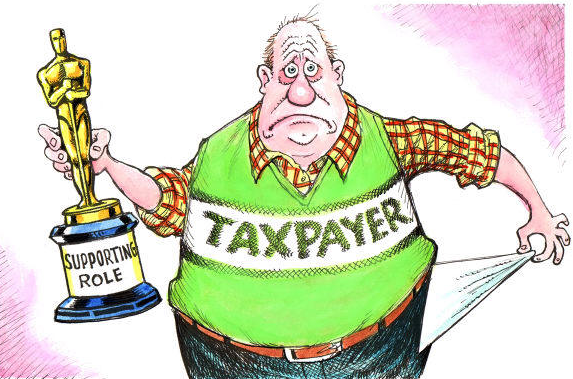 The end of tiered water billing? Court decision may drain the clout behind governor’s water orders - Trying to “encourage” water conservation by charging higher and higher rates linked to increasing use is unconstitutional, says the California 4th District Court of Appeal. Its ruling is in the case of the Orange County city of San Juan Capistrano which was sued by the Capistrano Taxpayers Association Inc. The city charges the biggest water users nearly four times what it charges the most frugal. Earlier, Gov. Edmund Brown Jr. issued edicts that demand an over 25 percent cut in urban water use. He made no demand on agriculture. Part of the governor’s demand includes having water agencies develop rate structures for force Californians to use less or pay higher rates. On Saturday, the State Water Resources Control Board issued its orders to the more than 400 water retailers in the state as to the percentage of water use to be cut. That order is expected to trickle down to cities, counties, irrigation districts and others establishing how to curtail water consumption. For the record, we did cover this story a little back in August of 2013 when it all began. 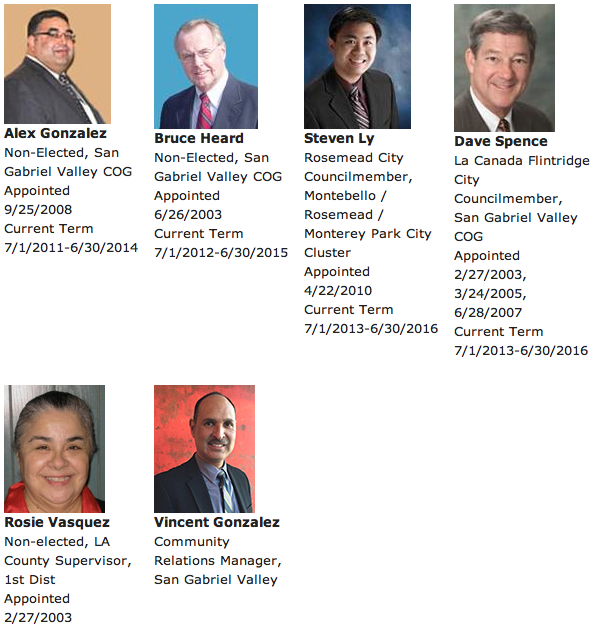 Check out who San Juan Capistrano hired to defend their legally at-risk tiered water billing system. None other than Michael Colantuono himself. Mod: Remember where you read it first. Election Wrap Up: What's Going On With The Pasadena Weekly And That Pay to Play Scandal? Being a dedicated political junkie I got way caught up in the Pasadena run off election vote tallies last night. 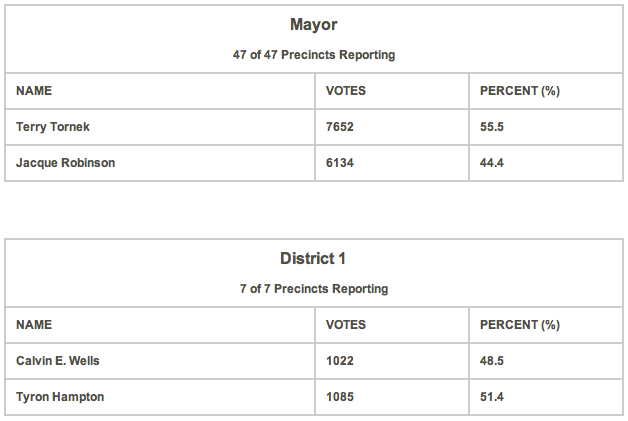 And, rather amazingly, the two candidates that were not backed by the often dominant city employee unions won. This despite the many assurances I'd heard proclaiming that Terry Tornek and especially Tyron Hampton didn't stand a chance against such money and tactics. And as you know I am sure, the Jacque Robinson for Mayor campaign was primarily based on the promise of delivering for the not exactly downtrodden and oppressed municipal employees of the Rose City. No matter how much more it would cost the people who have to live there. All of which now begs the question, how will Pasadena survive without $225,000 a year beat cops? 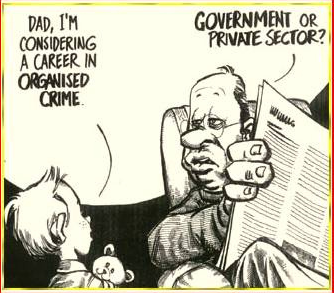 Or multi-millionaire Fire and Police Chiefs? 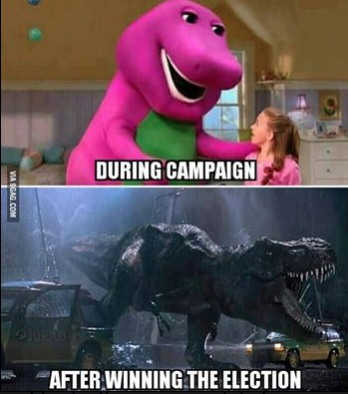 In case you haven't been following this as closely as I have, the rather nasty whispering campaign unleashed against Tyron Hampton by the Calvin "Millionaire Chief" Wells campaign was one for the record books. They even attacked Hampton over a personal disability. Financed by a lot of union money, it was their hope that by keeping Hampton off of the Pasadena City Council there would be raises and bennie bumps all around. This in a city where the average city employee salary is around $128,000 already. But the two union candidates lost, and somehow fiscal sanity carried the day. Or at least so it is hoped. We'll have to wait and see how this all works out. But there is one big mystery that remains. The Pasadena Weekly, which apparently selected itself to be the print venue for much of the garbage being slung at Tyron Hampton, became something of a target as well. 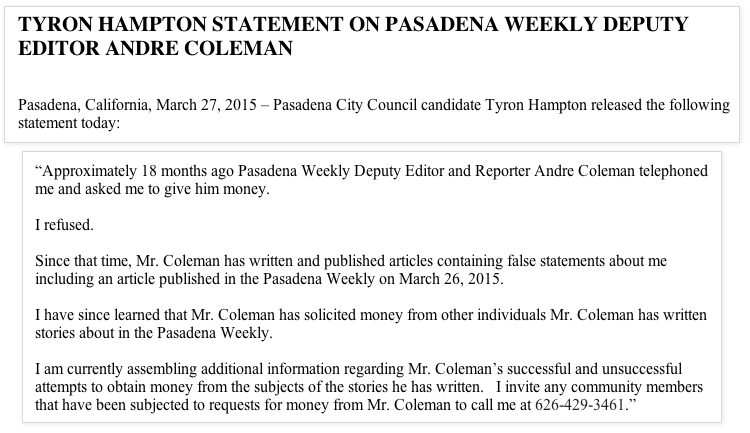 With its preeminent political columnist, Andre' Coleman, being accused of soliciting money from candidates in exchange for favorable treatment in his political reporting. The rumors about these alleged attempts at influence peddling (or, if you prefer, extortion) got so bad that the Hampton campaign released the following press release in late March. Now that Hampton has been elected to the Pasadena City Council, this all takes on a heightened level of relevance. And if true, it is one hell of a scandal. One that calls into question the integrity of the Pasadena Weekly and its role there. The paper may very well have become an embarrassment to both itself and the city it claims to represent. The elections in Pasadena are over and Tyron Hampton is the newly elected City Councilman for District 1. 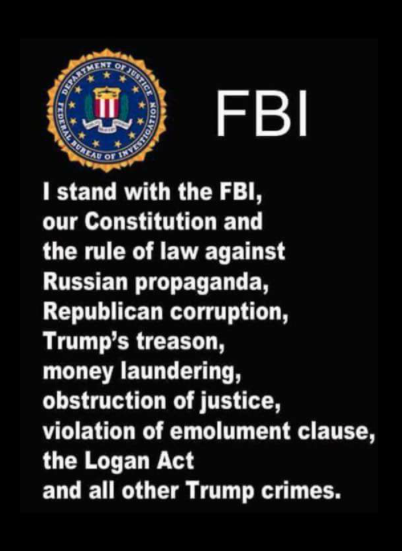 So can we at last get to the bottom of this mess? It is now time for the Pasadena Weekly - or somebody - to finally come clean. Today Is Election Day In Pasadena - Is Everybody Just As Excited About That As Bill Bogaard Appears To Be? I didn't think so. Since only around 1 in 5 (or 6) registered voters in Pasadena is expected to show up for this train wreck of an election today, it appears that even the people actually living there couldn't care less. And if you think about it, why should they? There are just so many far more fabulous things for them to be doing than drive to some stuffy old school foyer and vote for one of the two Mayor wannabe Councilcritters who snoozed through the biggest embezzlement scandal in that city's history. And then blamed it all on city staff, of course. Here is an interesting Pasadena fact. 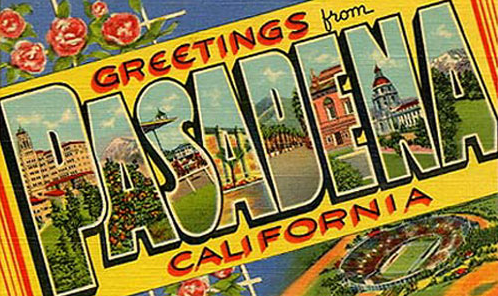 According to CityData.com (link), the average household income in Pasadena in 2012 was $65,423.00. 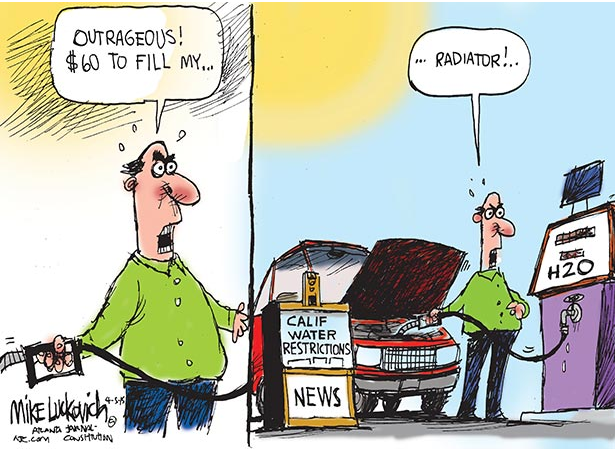 Which is actually somewhat above what the average California household is making these days. But not that much. Here is the helpful two-toned graphic CityData supplied to illustrate this important data for us. Transparent California puts that PeeDee median household income number at $55,809.00. So let's drop it in near the middle and agree on $60,000.00. Either way, I don't know how a household living in the Rose City could get by on that little dough. What with the price of a new Lexus these days. Not to mention the cost of pastry at Euro Pane. But Pasadena actually does have its less well-off citizens. You just are not encouraged to view them for any length of time. 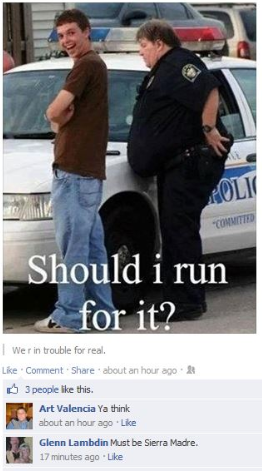 Besides, they're too busy running for their lives from members of a gun happy Police Department who are making an average of $175,000.00 per year. And are currently conducting labor actions for even more. 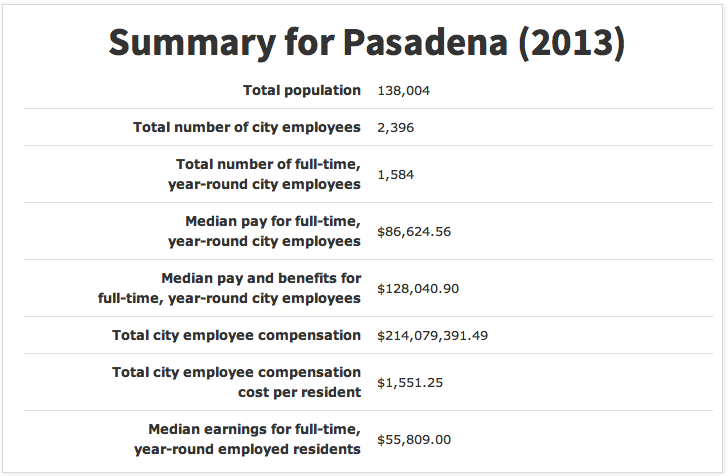 So what exactly does the average City government employee make in Pasadena? The following figures are supplied to us by Transparent California (link), who obtained this information through a PRA request to the Home of the Dome. That average city employee compensation figure would be $128,040.90, or approximately double what a typical resident household in Pasadena takes home. Outrageously out of balance I know, and a telling indication of just how badly the city government there is ripping its taxpayers off. 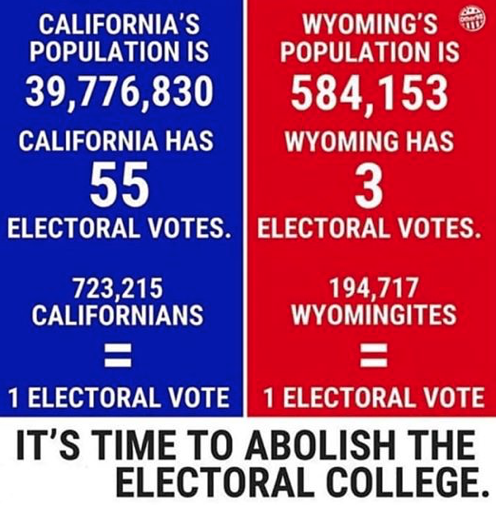 Not that too many seem to mind enough to actually go to the polls and throw the bums out, mind you. However, those crazy out of whack numbers do make sense if you happen to be newly elected PUSD Board of Education member Patrick Cahalan. Here is how he attempted to explain this troubling math yesterday to the readers of the near informative Pasadena Politics Facebook page. The problem is that you're only doing a first-order analysis on that data and thus you're not really finding out anything. Yes, we have a 137,000 residents according to the 2010 census. Pasadena has a decent number of folks who live here and work elsewhere (mostly downtown). We also have a significant incoming commuter population. Back in 2000 I seem to remember seeing a traffic analysis that suggested that about half of our working age population are exports to other local working areas (folks with commutes > 30 minutes) and about half of our working population is inbound on the freeway every day. Can't find the citation, I thought it was somewhere in my pile of 210 extension docs, but the tag line was something along the lines of "Pasadena has a living population of 135,000 and a working population of 180,000 and most of the folks that work here don't live here and vice-versa". Searched for it just now and can't find it, so I'm trusting memory here and I could very well be wrong. But it points out a serious flaw in trying to draw out anything from what our resident population is v. what we pay for city government. Also, as I previously mentioned, it ignores a lot of nuance in Pasadena, such as revenue streams from things other than taxes (e.g., the Rose Bowl). We also have a lot of municipal employees that other cities don't have, who provide services that are given by the private sector in those cities. For example, the link you keep posting? If you scroll through that list you'll find all sorts of folks employed by Pasadena Water and Power. Arcadia gets their power from SoCal Edison, so that entire tree of expenditures wouldn't even show up under their list of city services. Now, yes, maybe you think PWP should be privatized, but the fact is that it's not, at the moment, and thus the numbers for Pasadena that result in it making it into your "top 10 most expensive city payrolls" are misleading, because you're comparing apples to internal combustion engines. Everybody get all that? Is this crystal clear now? Good. Because Patrick is going to be making a lot of important decisions for you as a voting member of the Pasadena Unified School District Board of Education over the next four years. Spending your tax money, and for the well-being of your kids. For a family of 4 that would come out to right around $6,200,00 a year. Or, for that average Pasadena family with a yearly income of approximately $60,000,00 (averaged out), around a tenth of everything they earn. Before taxes, of course. And yes, that is the 10th highest city government employee compensation cost per resident in all of California. I do hope they enjoy their services. One candidate in the runoff for a Pasadena City Council seat actually became a millionaire on the public dime. I kid you not. And now he wants to get elected so he can make sure a lot of other oppressed city workers will become millionaires as well. Which is why the city employee unions there are throwing mad stacks at him. It's a gold rush, and all on the backs of families making an average of $60,000 a year. His name is Calvin Wells, and here is what he pulled down in his last two years of serving the people. Yep. That is well over half a million dollars in 2012 and 2013 alone. After which he retired on a yearly pension that could choke a plow horse. How awesome is that? A lot of unfortunate things can happen when you're off at the Cheesecake Factory pounding down fatty snacks instead of doing your civic duty and voting. 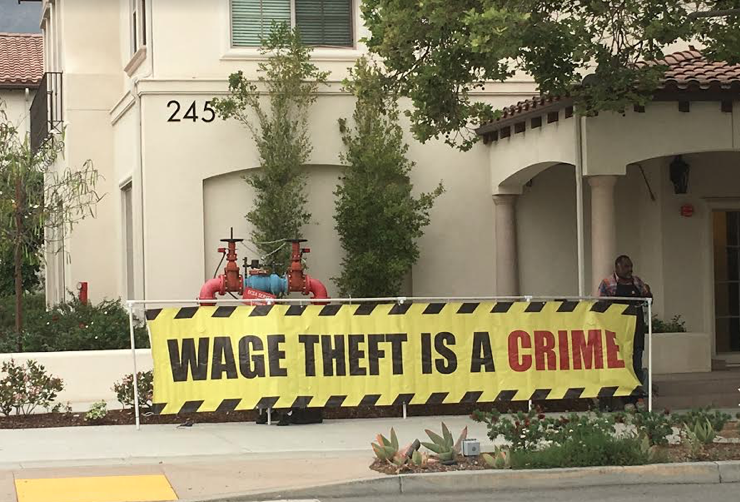 Now if you were a Pasadena City Hall worker hauling down a cool six figure salary, this next example of the Rose City Misery Index for the average wage earner would not trouble you. Why? Because, as the recipient of compensation far above that of mere taxpaying residents, you would be sending your sprouts and tads off to private school. Right? Of course you would. Most of them do. One website of note has just published its "Best School Districts for Your Buck in California" list for the year. They rank 375 Cali public school districts by using various insightful criteria, all of which is explained in some depth here. 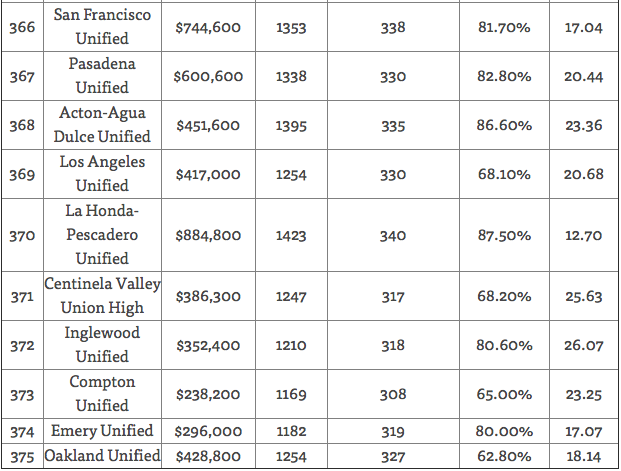 So would you care to see the Bottom 10 Schools Districts in the State of California? Not bad for one of the most heavily taxed cities in California, right? And with among the most lavishly compensated city employees to boot. Maybe we can get recently elected PUSD Board of Ed member Patrick Cahalan to explain that to us as well. Be sure to bring along some tinfoil.